> > require one read port more than suffices. They're not completely orthogonal. Typical code without redundant loads would use more registers and would therefore require extra instructions to load data into registers and spill them when running out of them. So code which freely performs redundant loads is a little more dense and will therefore have more non-redundant loads per cycle. And that can make it a small factor in determining the right number of L1 read ports. Reversely, increasing the number of L0 entries would increase its hit rate and reduce the need for multiple L1 read ports. So the two are definitely not orthogonal. The number of registers also affects it, and AVX-512 has more than prior x86 register sets so that avoids spilling. It really becomes a question of balancing the cost of stalling once in while, versus the cost of a bigger L0 cache, to keep it at one L1 read port. It's only when that balance is unfavorable either way, that you'd have to consider two L1 read ports. But I have yet to see a significant number of real-world examples where anything less than two non-redundant loads per cycle is unacceptable. Nicolas Capens (nicolas.capens.delete@this.gmail.com) on January 26, 2014 1:14 am wrote: > Eric Bron (eric.bron.delete@this.zvisuel.privatefortest.com) on January 24, 2014 3:20 pm wrote: > > > There is no need to have a hit on every redundant load. Just enough for the L1 to only > > > require one read port more than suffices. > > > > as already explained the number of L1D read ports is an orthogonal > > issue (required for typical worloads without redundand loads) > > They're not completely orthogonal. Typical code without redundant loads would use more registers and would > therefore require extra instructions to load data into registers and spill them when running out of them. So > code which freely performs redundant loads is a little more dense and will therefore have more non-redundant > loads per cycle. And that can make it a small factor in determining the right number of L1 read ports. > > Reversely, increasing the number of L0 entries would increase its hit rate and reduce the need > for multiple L1 read ports. So the two are definitely not orthogonal. 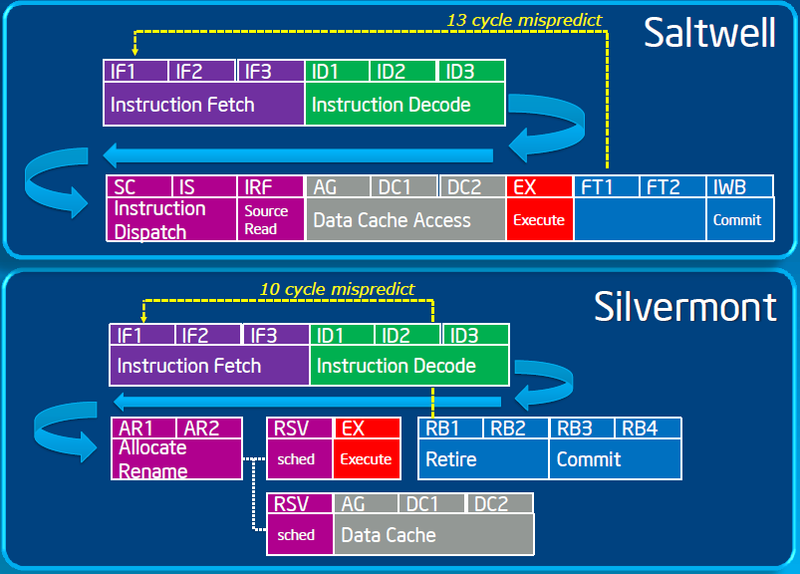 The number of registers > also affects it, and AVX-512 has more than prior x86 register sets so that avoids spilling. > > It really becomes a question of balancing the cost of stalling once in while, versus the cost of > a bigger L0 cache, to keep it at one L1 read port. It's only when that balance is unfavorable either > way, that you'd have to consider two L1 read ports. But I have yet to see a significant number of > real-world examples where anything less than two non-redundant loads per cycle is unacceptable.